When I was 15 I had no idea that 15 years later I would dress like Robert Mitchum in The Night of the Hunter. I hadn’t even seen the movie up until a month ago. I read a great post on the Selvedge Yard and had to see it, Mitchum just seemed awesome. In this role as Harry Powell (The Preacher) In the Night of the Hunter, he is dressed in a black old fashioned suit, black hat, western tie and with the now legendary Love – Hate tattoos on his hands. I don’t know how I could end up thinking that would be an good way to dress, without being in a movie from 1955 portraying an evil swindling preacher, but I did. When I was 15 I started to buy second hand clothes, at first with not much understanding or thought, it was a bit of everything, but quite soon a style started to emerge. I went through the normal mid-teen kind of hippie style with flared cord jeans etc, my God I hate hippies, how could I? In my late teens I dressed like a full blown early Seventies rock star, think Rolling Stones and the Faces, with tight boot cut jeans, wide belts, Chelsea boots, shirts with long collars and a tight suit jacket on top of that. I played in a band called Stardust City and we were all in to the same kind of look. I remember in my early twenties I was up in the North of Sweden on a photo job and I had gone through all the charity shops on the way up and had filled the trunk with clothes for me and my girlfriend at the time Anna that was with me. We stopped and I changed my shoes from my old Puma Roma I was wearing to a pair of old pointy toed black leather shoes and I promised myself that I would never ever wear anything else than old mans leather shoes or Chelsea boots, this worked quite well until I moved to Barcelona. When I was 25 I moved to London and I had started to wear more Sixties suits and this was my mod period. Anna that moved with me forced me to try on a waistcoat later that year and I haven’t taken it off since, well I have about 30 now but I normally wear a waistcoat everyday since. I don’t know what happened but I feel naked without a waistcoat. The fashion went from mod to the good old west, it was still 60’s, 1860’s that is. Here I am now, I still fit in all my old clothes and I occasionally look like some early Seventies rock star or dress up in one of my Sixties mod suits, but most of the time I just wear my skinny black jeans, boots, shirt, waistcoat and what ever suit jacket that feels right for the day without thinking about if the lapels are 60’s or 70’s. My inspiration went from the Rolling Stones and the Faces to the Band and without knowing it, Robert Mitchum in The Night of the Hunter, especially now in the winter with my black Stetson on. My main concern is always, what can I do when the summer comes? Last year I lost it completely and wore shorts from May to September, anything to survive in the Spanish heat. I don’t know if I pulled it off or not but it just got too hot with my super tight black jeans and shorts felt like such a relief. 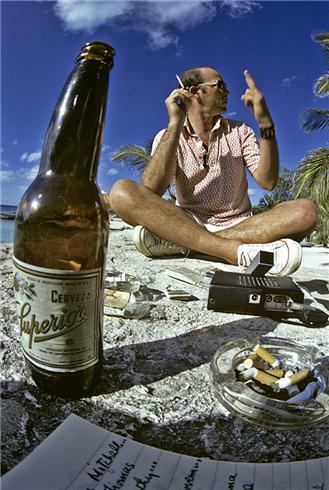 Hunter S Thompson used to wear shorts, I’m not sure if that’s enough to make it legit as a gentleman’s way to dress in the heat or not but it’s good enough for me. The following images and text is taken from a great Robert Mitchum post by the Selvedge Yard. 1955– Robert Mitchum in ‘The Night of the Hunter’ –Image by © CinemaPhoto/Corbis. Many consider Robert Mitchum’s portrayal of Harry Powell (The Preacher) to be his finest. Based largely on the real-life murderer Harry Powers, AKA “the Bluebeard of Quiet Dell” who terrorized West Virginia back in the early 1930s. Convicted of killing a widow, her three children, and another widow– Powers was hanged to death on March 18, 1932, at the West Virginia Penitentiary. I was raised with Rod Stewart, my mum used to listen to Atlantic Crossing* every weekend when she was cleaning the house. Growing up I didn’t know better and I thought that was how Rod Stewart had always sounded, boy was I mistaken. Later in life, maybe mid-teens I found a Rod Stewart vinyl with his greatest hits from before his move to America and after that day I was in love. I realised that this guy could really sing and that he wasn’t just some sleazy ballad singer that entertained mums when they were cleaning. This was magic. His voice, the songs and especially the guitar playing. 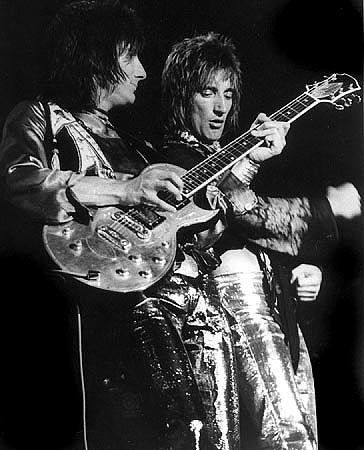 I think I have been in love with Ron Wood’s guitar playing for as long as I have listened to Rod Stewart. There was something special about the chemistry between the musicians on Rod’s albums and as soon as I bought my first The Faces album I knew why. Here you had the whole Small Faces but with Ron and Rod instead of Steve Marriot. The rhythm section had played together for years and Ron and Rod knew each other from touring America with the Jeff Beck group. They sounded amazing from the start. The Faces became my favourite rock band and I still have more respect for them than The Rolling Stones. They created a whole new genre in England inspired by southern rock, boogie rock, blues and soul. After reading Rod Stewart’s, Ron Wood’s and Ian McLagan’s biographies you start to realise that they probably had quite a lot of fun during their drunken heydays as well. On their tours in America they always had a fully equipped bar on stage with a bartender dressed in a tailcoat. Ian also requested a white grand piano for every gig since they were so convenient to line up coke on, everything so the band could stroll around on stage and get their refreshments when needed. I used to be a photographer for one of the main papers back in Sweden and was once sent to shoot Lenny Kravitz in Copenhagen. On the way back to Malmo the journalist I was with started to tell me stories about his life. He had seen The Faces live in Copenhagen in 1971 and he claimed that was the best rock gig he had ever seen in his life, all the Rolling Stones and Bruce Springsteen tours he had witnessed included. He also told me that he saw the Faces play in Lund two days later and that was the worst gig he had seen in his life. The boys were so drunk that they couldn’t stand up straight or play properly, they just fell over each other all the time. I think I would have given quite a lot of money to have witnessed the mayhem of the drunken Faces as well. After a few years in London I actually ended up in Muswell Hill, close to where Rod Stewart bought his first house when he started to make some money. And every time I took the bus from Muswell I went past Highgate and Archway where Rod grew up and went to school. By the way, his family house the old post office has been replaced by a gas station, to my disappointment. Rod Stewart has probably helped me more than anyone else through the difficult times I have faced in the past. I think every time a girlfriend has dumped me I have locked myself away with a bottle of whisky and listened to either some early Rod Stewart or The Faces loud on the stereo. According to me the best medicine there is for broken hearts. *Atlantic Crossing was Rod Stewart’s first solo album without Ron Wood and the others from the Faces. It was recorded in 1974-75 with some of the best studio musicians in America and even though it’s not his worst album, it can never be compared to his 5 previous albums.